The Lower Modernisms – 030. Lomo Featured Project: Buttonwillow Rest Stop. Lomo Building Types: Washroom Buildings. October 4, 2011 by James Black. 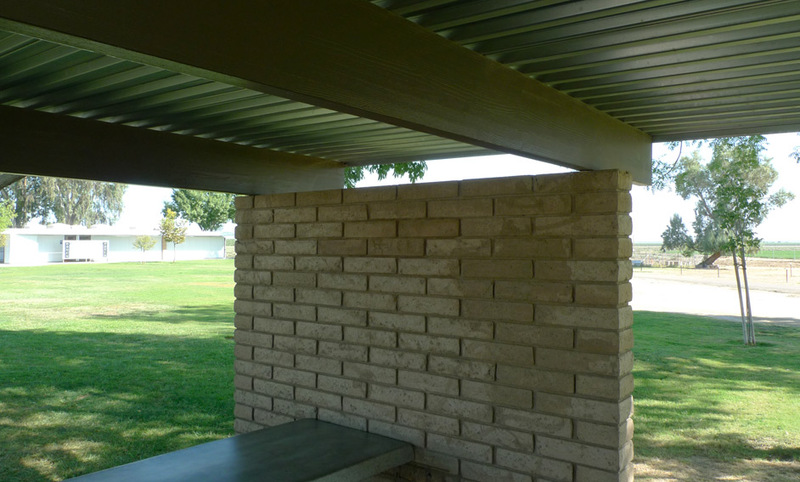 With so few details, the picnic canopy at the Buttonwillow Rest Stop off of northbound Interstate 5 is nearly a perfect building, a mini-Barcelona Pavilion in which Less is More. As conceptually introduced in Lomo post #003, such humble buildings as these, despite the integrity they may possess as modernist design, are ordinarily excluded from the canon of Modernism by the humility of their programme. Yet that humble programme paradoxically liberates these buildings from the burden of functional requirements and often leads to a more rigorous architecture. The plan reveals the essential elegance of the design, its literal adherence to its diagram, as well as the way that the brick shear walls are staggered jauntily on each side to create a simple sense of rhythm. 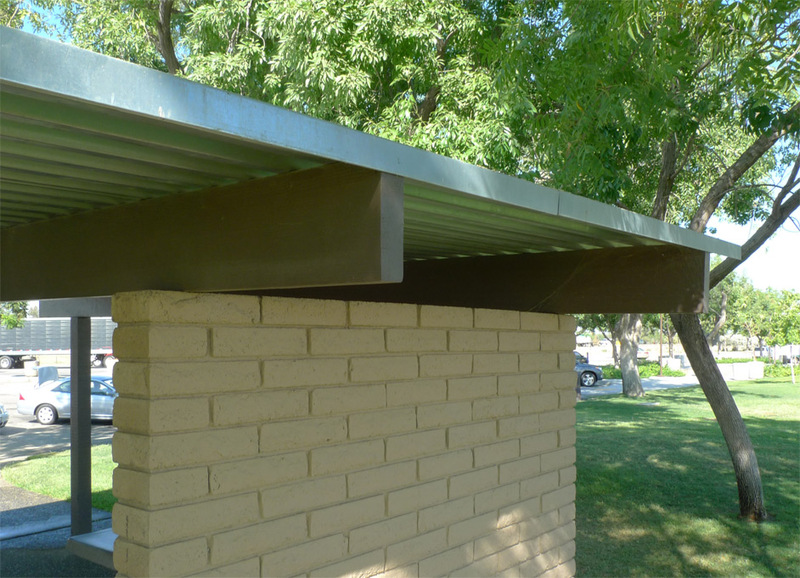 Concrete picnic tables are aligned with both of the brick wall segments on the east side of the building, so that the canopy’s programmatic use is related to the diagram. The materials are simple and rugged, and detailed so that the connections are nearly invisible, as if the beams were stacked atop the brick walls like Lincoln Logs. The gap between the beams recalls what Craig Ellwood termed the “flash-gap” detail, which his office used in the design of decidedly un-Lomo custom homes where it would be infilled with glass. 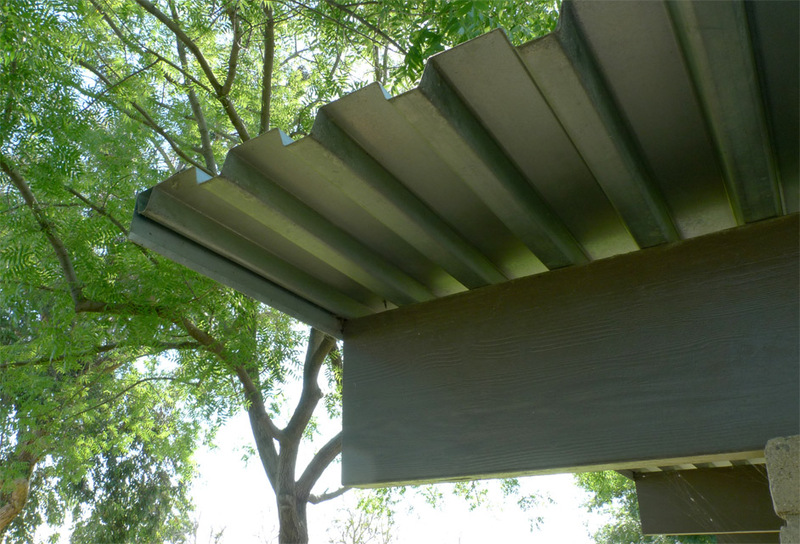 A home is burdened with a greater need for weather protection, and the detail used in the picnic canopy is thus a purer implementation of the idea, whereby the distinctness of wall, beam and roof are expressed and emphasized by the void in between. The unblocked void between deck flutes is also expressed, a smaller scale version of the flash-gap, and the deck edge is cantilevered and left exposed. The galvanized steel deck is unpainted, and likely of recent installation. I speculate that this canopy would have been originally decked with tongue-and-groove planks atop the 4x beams. My speculation is fueled in part by the egregious use of corrugated metal paneling over the adjacent washroom building, quite obviously of recent installation on this building likely constructed around 1960. California’s rest stop pavilions are endangered by the general bad taste of practicing architects. 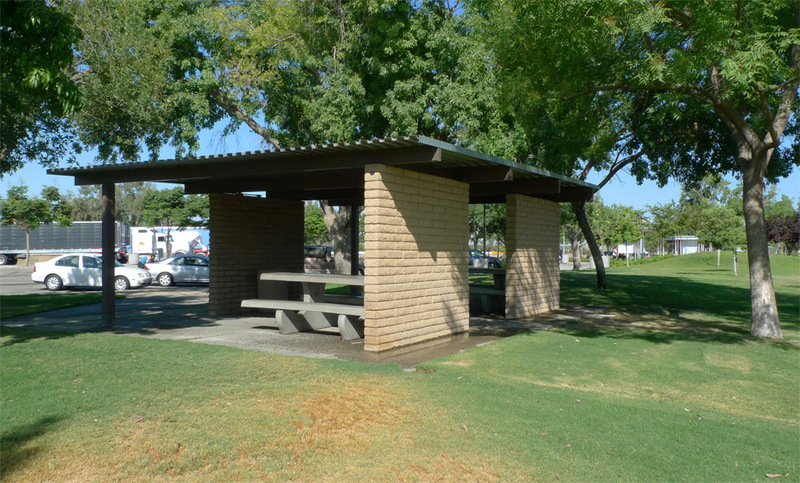 Critic Aaron Betsky made rest stops the subject of a column in the August 2011 issue of Architect Magazine (page 88). Betsky characterizes rest stops as a distinct physical type, emerging from the margins of leftover space and shaped by “the curves of the on-and off-ramps, the parking areas, and other utilitarian concerns.” Betsky also describes the user groups associated with rest stops as consisting of truckers, patriots and perverts: “It is where people with desires that they feel they cannot satisfy at home or in a more traditional setting go to meet their needs.” I referred to this aspect of the reputation of rest stops in Lomo post #003 as well. Cruisiest Spots: The restroom-Located on the left side of the building, enter through the 2nd door. Gloryhole between urinals and stall. I unfortunately overlooked this detail on my visit, but a Glory Hole is an important architectural detail for a couple of reasons: it is a type of aperture that establishes a truly unique relationship between the public and private spheres; and it is subversive, in the sense that it is an architectural detail created not by the architect but by the building’s occupants. Despite their uniqueness, glory holes have largely been neglected by the academy, although it is just as well that they have not been subsumed by building codes and complicated by accessibility requirements. Love this posting. Especially the critique of the academy for ignoring the social and architectural importance of those unique aperture conditions often found in reststop bathrooms.